They create floral designs made from a variety of quality pralines, jelly candies and other delicious sweets. The candy is packaged in a unique way to appear like a real, fresh and colourful bouquet of flowers. As pioneers into unchartered territory, they take pride in the fact that they are the first commercial company who have taken the initiative to open as a chocolate floristry shop in South Africa. 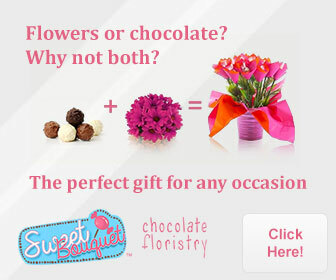 Sweet Bouquet is the largest company specializing in chocolate designed bouquets as well as other gifts in South Africa.